Natural Factors Soy Isoflavones complex contain naturally balanced isoflavones, genistein and daidzein. They are flavonoids derived from soybeans and soy foods. 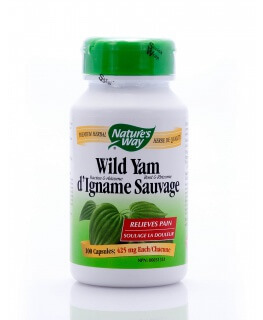 They are called phytoestrogens because they are estrogen-like substances present in plants. Nowadays people are consuming more of the soy products because of their many health benefits, including protection against heart disease, osteoporosis, breast cancer and prostate cancer. It is also showing promising results in relieving menopausal symptoms, balancing reproductive hormone and regulating healthy menstrual cycle. 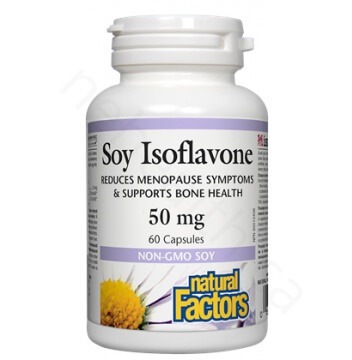 What Are the Key Health Benefits Associated with Natural Factors Soy Isoflavone? Non-medicinal ingredients: Microcrystalline cellulose , gelatin capsule (gelatin, purified water) , vegetable grade magnesium stearate (lubricant). Recommended dose for reduction of Bone Mineral Density (BMD) loss (post-menopausal women): 6 capsules daily or as directed by a health care practitioner. Take a few hours before or after taking other medications or health care products. Use for a minimum of 6 months to see beneficial effects. Consult a health care practitioner for use beyond 1 year. Recommended dose for reduction of Menopausal symptoms (menopausal and post-menopausal women): 7 capsules daily or as directed by a health care practitioner. Take a few hours before or after taking other medications or health care products. Use for a minimum of 2 weeks to see beneficial effects. Consult a health care practitioner for use beyond 1 year. Han, Kyung K., et al. 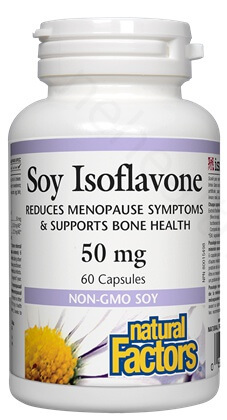 "Benefits of soy isoflavone therapeutic regimen on menopausal symptoms." Obstetrics & Gynecology 99.3 (2002): 389-394. Sarkar, Fazlul H., and Yiwei Li. "Mechanisms of cancer chemoprevention by soy isoflavone genistein." Cancer and Metastasis Reviews 21.3-4 (2002): 265-280. Scheiber, Michael D., et al. "Dietary inclusion of whole soy foods results in significant reductions in clinical risk factors for osteoporosis and cardiovascular disease in normal postmenopausal women." Menopause 8.5 (2001): 384-392.